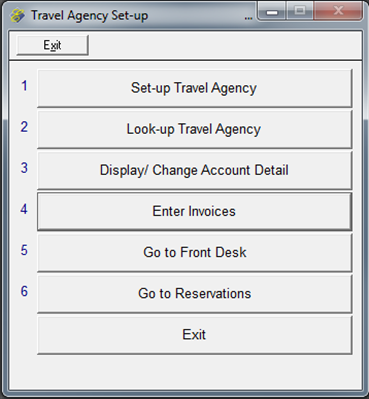 Travel Agency Setup allows you to set up a new travel agency, look up a travel agency by name, display travel agency detail, and display, change, or manually enter invoices. 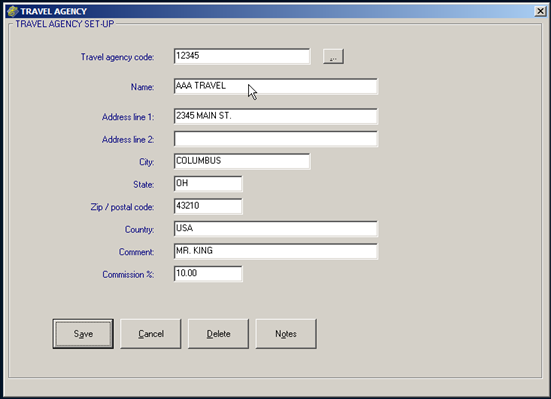 Once a travel agency has been set up you can enter the travel agency code into a reservation or folio. Travel Agency reservations can be tracked and commissions can be paid from Execu/Suite. When a travel agency is assigned to a guest, the guest information including total room charge is sent into the record for that travel agency. The system will calculate commission based on the percentage assigned to the agency. Travel Agency commissions can apply to charges in addition to RC* if these are included in the MENUINI.FIL configuration file. Wholesalers typically are processed through Direct Bill. Some hotels use Travel Agency Processing to track employee reservations so that commissions or incentives can be paid to the employees. Employees are set up in the same way as travel agencies. The employees can be paid through the Travel Agency Checks function or the employees' invoices can be marked "paid" when the employees are paid through payroll. 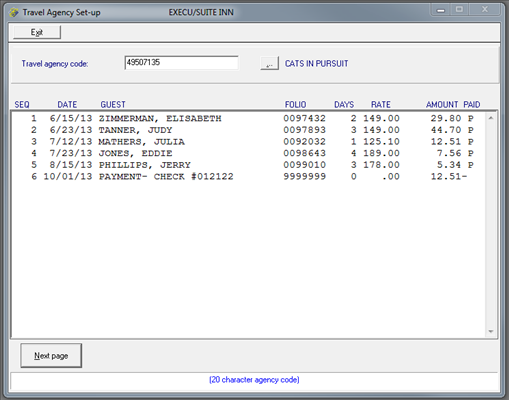 Execu/Suite's Travel Agency detail does not import into payroll. You would print a report and then enter the commission, bonus or incentive into payroll manually. Go to Manager/Setup > Travel Agency Setup > Set-up Travel Agency. "Travel agency code" may be any alphanumeric code up to 20 characters. You may use a TIDS or IATA code or your own code for this travel agency. If you are setting up employees to pay or track you might want to use initials and/or position such as JWJ-FD or similar. 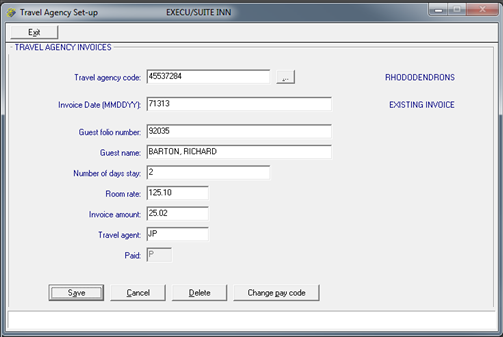 Although reservationists can look up travel agencies by name, time is saved if you make the code easy to remember and type. "Name" may be up to thirty characters and will be the search parameter when looking up travel agencies by name. This also will print on reports and on the check when you pay the travel agency. "Address line 1" may be up to 30 characters. "Address line 2" may be up to 30 characters. "City" may be up to 20 characters. 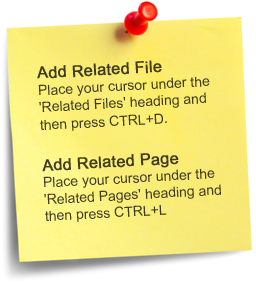 If the city is within US or Canada and is included in Execu/Suite's ZIP/Postal code database, you may skip this field. "State" may be up to 5 characters. If the state/province is within US or Canada included in Execu/Suite's ZIP/Postal code database, you may skip this field. "Zip/ postal code" is the US or Canadian postal code for the city and state/province. US should be in this format: 00000 where 0 represents a numerical digit. Canada should be in this format: A0A 0A0 where A is a letter and 0 is a digit and the space is included. If the postal code exists in the database, the city and state or province will populate. "Country" should be filled in if outside of North America. "Comment" may be a phone number, travel agent's name, etc.